A single mom who put herself through law school and co-founded the National Network to End Domestic Violence, Donna became the first African American woman to represent Maryland in Congress in 2008 and was a leading progressive voice in Congress for eight years, becoming the very first member of the House to propose a constitutional amendment to overturn Citizens United. Now she’s running for County Executive of Prince George’s county, Maryland’s second-largest jurisdiction. Hello and good evening — my name is Donna Edwards. I served eight years in Congress fighting for progressive values, and today I’m a candidate for local office, for County Executive in Prince George’s County, MD. I’m proud to deliver the official Working Families Party response to the State of the Union address this evening. My fellow Americans, one year into Donald Trump’s presidency we have seen our government run by and for billionaires and promoting racist policies targeting people of color. From the Department of Education to The Environmental Protection Agency, Trump has handed over the levers of government to his billionaire friends and anti-government allies. The President who stood before the American people tonight is upending the rule of law, destroying institutions, and engaging in an unprecedented purge of the Department of Justice as Special Counsel Mueller closes in on him– all while Congressional Republicans remain silent. There has been one saving grace — and it’s a big one. All across our nation, in communities and neighborhoods just like mine in Prince George’s County, Maryland, the spirit of grassroots resistance and civic renewal burns bright. It is a spirit that has mobilized our communities time and time again to protect the most vulnerable and stand against the looting of our democracy. As President Trump said tonight, this is an administration whose proudest accomplishment is the Republican tax scam. Which is more than a scam really — it’s a heist that benefits some of the richest people who have ever lived, perpetrated by their bought-and-paid for puppets in government–in the Executive Branch and in the Republican-controlled Congress. And the rest of us will have to pay for President Trump and his conservative cronies’ greed. It was Trump and his callous allies in Congress who failed to fund the Children’s Health Insurance Program for 9 million children for 114 days, cynically putting children’s health on the line as political pawns. It was Trump who terminated the Deferred Action for Childhood Arrivals program, or DACA, and then chose to use almost one million Dreamers and their families as bargaining chips for his border wall. It was Trump who abandoned Puerto Rico and terminated Temporary Protected Status for Haitians, Salvadorans, Nicaraguans and Sudanese people. It was Trump who disparaged these nations and the entire continent of Africa while Congressional Republicans stood quietly on the sidelines. I’ve been an advocate in my community for over three decades. I served five terms in Congress. I stood up to Republicans, and I’ve taken on the Democratic establishment in my local community and in Congress. But I’m speaking to you this evening not as a political leader, but as one person with a story like many millions of others in this nation who are hurt by Trump administration policies. About eighteen months ago, I was diagnosed with multiple sclerosis or MS. It’s an autoimmune disease of the central nervous system affecting more than one million Americans. MS is a chronic illness, but it’s different for everyone. I am fortunate to have received an early diagnosis and I am receiving great care…for now. But for others who live with MS and other chronic illnesses, the skyrocketing cost of prescription drugs and medical care can really be expensive without medical insurance. Through enormous courage and bravery, Americans came together and stopped the worst parts of Trumpcare from becoming the law of the land. People wrote letters, called and visited their members of Congress by the millions in protest … in red states and blue states. I’ll never forget seeing disabled protesters, including members of ADAPT, put their bodies on the line to fight the Republican healthcare plan. We thought we’d won. We were wrong. The underhanded cuts to healthcare Trump included in his tax plan and his executive actions pose a serious threat to healthcare still. Because of the Trump tax scam, a projected 13 million Americans will lose their healthcare altogether, and it will be more expensive for millions of others to maintain their existing care. Unlike many of my former colleagues in Congress, and like so many Americans, I’m not wealthy and so I understand personally how a policy change in Washington buried in a thousand-page tax law can cause too many of our neighbors to pinch their pocketbooks and drain their resources — or not seek care until it’s just too late. Conservative Republicans like Paul Ryan are already planning to use the $1.5 trillion dollar deficit created by their tax plan as an excuse to gut Medicare, Medicaid, and nutrition assistance for vulnerable families. They have already promised it — so finding a way to deliver so-called “entitlement reform” by any means necessary would fulfill a long-time dream of the far right. And, Donald Trump will be right there with them. Tonight, we also heard more details about Trump’s latest con, the Trump infrastructure scheme. Just like the Republican healthcare plan and the Republican tax scam, it’s actually about enriching the wealthy and having the rest of us foot the bill. Trump’s con slashes America’s infrastructure investments, would kill jobs and hand off these projects to Wall Street banks and foreign investors. Together, we can make sure that President Trump and his agenda does not leave a permanent stain on America. I haven’t given up the fight. That’s why I’m running for Prince George’s County Executive — on the ground getting things done for working people–education, jobs, increasing the minimum wage and beating back monied interests. I won’t let Trump get in my way, and neither should you. Look, I got my start in politics as an organizer in my community. I fought for survivors of domestic violence, and I fought against the corrupting role of big money in politics. I’m thrilled to see Americans of all stripes grooming new leaders to take on new activism. We all have a role to play in ensuring our communities thrive no matter what Trump throws at us. I join many, many thousands of people who, in response to the devastation brought on by the Trump election, decided to step up and run for office. Personally, I’m proud of my former intern, Juwan Blocker, who is running to make a difference on our local school board — not to tweak, but to transform. He joins Wala Blegay, Maurice Simpson and Nicole Williams back home in Prince George’s County who like millennials across the country are ready to take state capitals by storm. 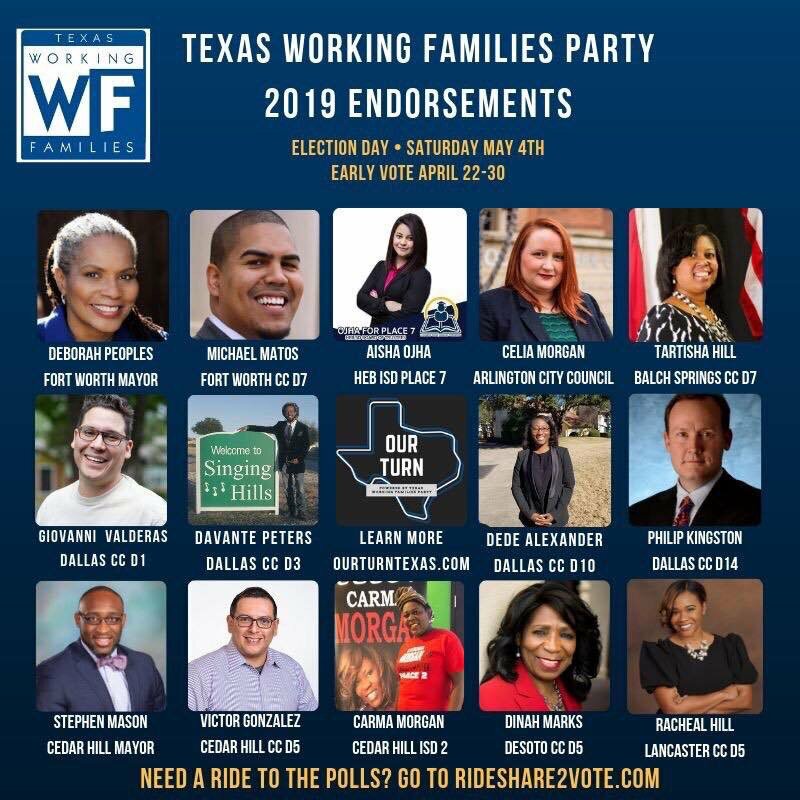 More than one thousand candidates backed by the Working Families Party ran for local and state office last year, and two-thirds of them won. That includes people like Larry Krasner, the new district attorney in Philadelphia, who ran on a platform of transforming the criminal justice system and ending mass incarceration. People like Crystal Murillo, a 23 year old Latina and daughter of immigrants, who ran for City Council in her home town of Aurora, Colorado, and defeated a Trump-backing, anti-immigrant Republican. 2018 is an opportunity for those of us who believe that America is still for all of us– not just the wealthiest one percent. Together we have an opportunity to block Trump by beating Republicans in Congress, in states and cities, counties and our local communities. To win, we need to do two things. First, all of us must continue to stand boldly against Trump and Trumpism. We are bigger than the hate that has taken residence in the White House. Shoulder to shoulder we can fight back — whether it’s running for office, making calls to our elected officials or putting our bodies on the line in protest. Second, we need candidates with bold vision for where we need to go. It’s not enough just to be anti-Trump, though that’s important. We have to bring solutions for rooting out income inequality, structural racism and sexism, and repairing our broken democracy — we had all those challenges before Trump and we need leaders willing to tackle our challenges and meet them with foresight and ingenuity. That means remaking our government to actually work for the many and not just the few. We need healthcare for all. We need to end Trump’s tax cuts for the wealthy, and ensure our nation has the means to invest in our infrastructure, education, good-paying jobs and retirement security. We need to get big money out of politics, by making elections at every level publicly financed, cutting the cord with developers, banks, big pharma, oil and gas companies, and all the interests that control public policy in states, cities, counties and Congress. We need to make it easier to vote, not harder. Easier to join a union, not harder. Easier to get a good education, not harder or more expensive. We should stand in the gap to restore the dream of DACA, and make sure police spend more time going after corporate crime than tearing apart immigrant families. We must transform the criminal justice system so it serves to keep all communities safe, invest in accountable partnerships between law enforcement and communities, legalize or at a minimum decriminalize marijuana, end the mass incarceration policies that put more people behind bars than any other nation in the world, and ruin millions of lives in the process, and invest in drug treatment, education, and jobs. We must refuse to leave our fellow Americans behind — half a million Americans are still without electricity in Puerto Rico and still desperately need aid. We must take seriously the threat of climate change and make a plan at every level of government to transition to a clean energy economy by 2050 that will keep our air and our water clean and our planet alive. We can advance all these goals if we organize. In 2018, together we will elect the next generation of progressive leaders to local, state and federal office. We’re going to shake off Trump’s dark shadow, and we’re going to fight for a real democracy that puts the people first — a democracy rooted in solidarity and justice. I hope you’ll join us by signing up at www.workingfamilies.org. I’m inspired by the number of people who ready to join the fight. I hope you’ll stand with me and with the Working Families Party to get organized in 2018 for our values and for our future. Remember what Shirley Chisholm taught us: If there’s no seat at the table, bring a folding chair. This isn’t just about what happens in Washington, it’s about all of us making a difference where we live. Nothing could be more important. Thank you so much for taking the time to listen. Let’s get this done.